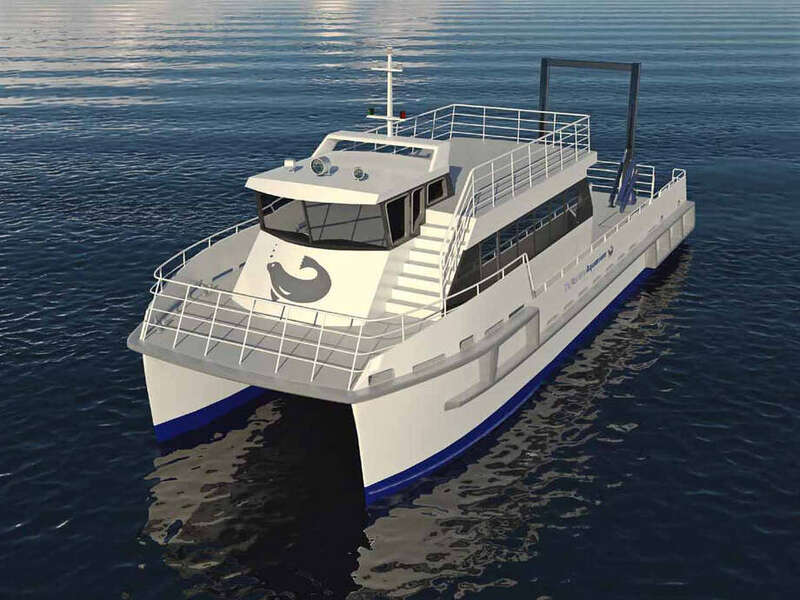 Artist rendering of a proposed $2.5 million, 65-foot catamaran hybrid research vessel The Maritime Aquarium in Norwalk is currently raising funds to buy to replace its 33-year-old diesel trawler. South Norwalk's Maritime Aquarium is $500,000 away from a new 65-foot catamaran hybrid research vessel, which would replace its current 33-year-old diesel trawler in the fall of 2013. Designed by an Australian naval architecture company, the $2.5 million boat, which has yet to be named, will run on a hybrid diesel-electric propulsion system, cutting diesel consumption by 75 percent or more. Solar panels and wind turbines would provide clean energy to run the ship's navigational and scientific instruments. Aside from its green specs, the vessel would serve the aquarium's new educational program TeMPEST (Teen Maritime Program Emphasizing Science and Technology), which aims to provide general and maritime education for underprivileged students. The aquarium will use the boat from April through October for its regular Marine Life Study Cruises, in which sea creatures are brought from the ocean for research, and from December through March for its seal watching programs. The new vessel, equipped with an indoor classroom and outdoor research space, will accommodate 65 passengers for these cruises. "This is basically going to be the coolest classroom in all of Connecticut and New York," said Cathy Hagadorn, the aquarium's education and vessel manager. The current vessel "Oceanic," which was donated by Stamford's Oceanic Society, has been in use since the Maritime Aquarium opened in 1988; the boat's limited 29-passenger capacity limited options for educational programming, and its age made it expensive to maintain, according to Jennifer Herring, president of the aquarium. The aquarium plans to sell "Oceanic" once the new vessel is completed, Herring said. Contributors to the new vessel project thus far include the TK Foundation, which provides grants for maritime education, the Per and Astrid Heidenreich Family Foundation of Greenwich and George and Carol Bauer of Wilton, who are avid supporters of the aquarium. "In a tough economy; we have been so surprised by the support we have gotten from outside sources," Hagadorn said. This vessel would make its debut as the Maritime Aquarium marking its 25th anniversary next year. "It's a way for students to get directly in touch with (the Long Island Sound), especially those undeserved students who would never had the opportunity to experience ... the waters that are right here in Connecticut's front yard," Herring said.